Mnemonic systems are fine for certain, specialized tasks. However, they are not relevant to most academic studying. Normally a student is asked to do much more than memorize lists of words or images. The goal is both to understand and to remember. Fortunately, those goals are very compatible. This part of the Memory chapter inspired Chapter Zero. Originally students encountered this material about halfway through the course. Some of them found it helpful, and some asked a logical question: "Why are you not telling us this information at the beginning of the course? Hence Chapter Zero. What is the best way to remember large amounts of material? Study skills courses give traditional advice, but some of the traditional advice is wrong! Two seemingly obvious but ineffective approaches to improving memory are (1) recite material to yourself repeatedly, and (2) try harder. Ironically, neither of these techniques helps memory. Neither repetition nor conscious effort to memorize is beneficial unless more sophisticated types of information processing are going on. The most essential form of information processing is in-depth comprehension. What two traditional techniques for improving memory do not necessarily work very well? Ebbinghaus, the pioneer of memory research in the 1880s, believed that repetition was the main variable influencing memory. However, modern psychologists found that effects of repetition were not dependable. Repetition only helps if useful encoding activity occurs during repetitions. For a person who repeats material without really understanding it, repetition does not help. When does repetition not help? Craik and Watkins (1973) introduced a distinction between maintenance rehearsal and elaborative rehearsal. Maintenance rehearsal is a form of repetition in which one "says something to oneself" but does not think about it in a deep way. Elaborative rehearsal, by contrast, occurs when one not only repeats something but elaborates upon it, relating it to other knowledge or analyzing its details. Elaborative rehearsal aids secondary memory; maintenance rehearsal does not. What two types of rehearsal did Craik and Watkins describe? Which type of rehearsal is "mindless"? To study maintenance rehearsal, Craik and Watkins invented a task called p-checking. They had subjects repeat the most recent item starting with the letter "p" as words were read to them at a rate of one per second. The figure shows a portion of the list from the Craik and Watkins (1973) study. The words presented by the experimenter are in the first column. The words repeated by the subject are in the second column. This procedure allowed the experimenters to control how many rehearsals each item received. Subjects repeated some words many times, others only once. The word pen, in this example, is repeated 13 times. Peach is repeated six times; plum only occurs once. Imagine being a subject in this experiment. While you repeat the previous p-word, you listen for the next word. You are saying "pen pen pen" but you are listening to "smoke...tie...fork..." because you must decide whether any of these starts with p. You are distracted and not really thinking about the word you are repeating, even while rehears­ing it. Craik and Watkins found that under these conditions, repetitions had no beneficial effect. 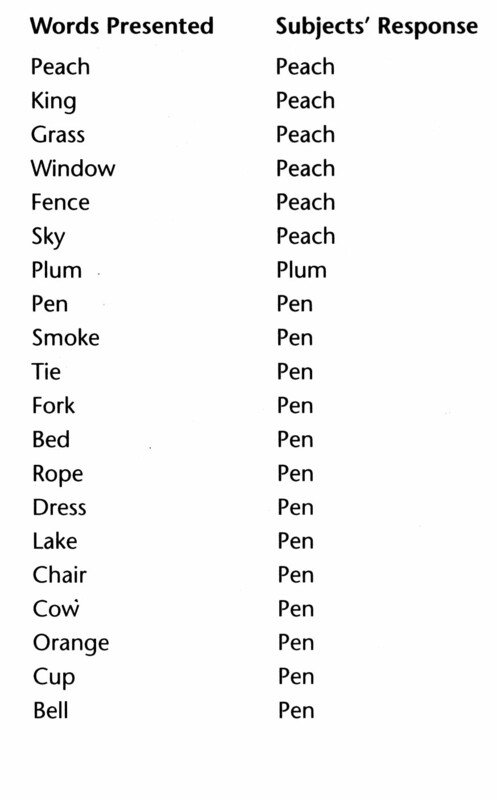 The word "plum" was just as likely to be recalled as the word "peach" or "pen." How did the "p-checking" study work, and what did it show? There is an important lesson here for any student. Merely repeating material does not strengthen a memory. Just saying it to yourself with minimal processing is not helpful. For repetition to be helpful, it must be thoughtful repetition. That has the effect of integrating the to-be-remembered material with other thoughts or images. The result is something like an interactive image or interacting meanings. Only that will help retrieve the needed information later. As a rule, repetitions of an experience farther apart in time will have greater effect in improving memory than repetitions close together in time. The spacing effect is a powerful and well-documented effect on memory. The spacing effect is robust, meaning (1) it applies to many situations and types of learning, and (2) it is dependable. It always seems to make a difference. It works with animals as well as humans, and it works with all different sorts of materials. The spacing effect has been known for more than a century. Dempster (1988) expressed exasperation that it was not used more often in schools. He wrote, "The spacing effect would appear to have considerable potential for improving classroom learning, yet there is no evidence of its widespread application." The title of his article was, "The spacing effect: A case study in the failure to apply the results of psycholog­ical research." What is the spacing effect? Why was Dempster exasperated? In one practical demonstration of the spacing effect, Bahrick, Bahrick, Bahrick, and Bahrick (1993) studied retention of foreign language vocabulary. Retention was greatly enhanced if practice sessions were spaced far apart. For example, "13 retraining sessions spaced at 56 days yielded retention comparable to 26 sessions spaced at 14 days." In other words, subjects could use half as many study sessions, if the study sessions were spread over a time period four times as long. How did researchers study massed vs. distributed practice in language learning? What is the simple principle that predicts the effectiveness of a "spaced" repetition? Why does the spacing effect work? There must be something basic and biological as an underlying mechanism, because the spacing effect works with all species and all materials, not just humans rehearsing verbal material. For students who are studying, there is another common-sense reason why spaced repetitions may be beneficial. When repet­itions occur after material is "on the verge of being forgotten" as Banaji and Crowder put it, a student will find out what information "stuck" and what did not. The widely spaced repetition focuses attention on weakly learned material. It allows special emphasis to be put on information that was hardest to retrieve. In general, good memory depends on effective encoding. This is not the same thing as trying to memorize. In fact, good memorizers seldom try to memorize. They adopt other strategies that use implicit memory processes to produce rich elaborative encoding. Most importantly, they cultivate an interest in the subject matter. They relate material to other ideas that interest them. They use their imaginations to enrich the context of learning. Bransford and Wilson (in Bransford, 1979) gave student subjects 30 unrelated nouns in a list. Group 1 was told they would have to recall the nouns and asked to memorize them. Group 2 was asked to rate each word for pleasantness or unpleasantness, a task said to stimulate "enriched encoding." Group 3 had to think about how they would use each object in the list if stranded on a deserted island. What was the Wilson and Bransford "deserted island" study, and what did it show? Groups 2 and 3 did not know they would be asked to recall the words later. Yet when they were tested a day later, they performed as well or better than Group 1, which tried to memorize the words. Group 3, which thought about how they would use the objects, had no idea they would be tested for memory later. But they recalled more words than Group 1, which tried to memorize. What is incidental learning? Why was it superior, in this case? In this case, accidental memorization, also known as incidental learning and implicit learning, worked better than conscious memorization. Why? The deserted island group was imaginatively involved with the task. They organized the material by relating it to a single guiding theme or idea. As Bransford (1979) put it, "Information about a deserted island provides a unifying theme or contextual structure that can facilitate organization and hence retrieval." This is similar to the unitization and interactive imagery concepts. Bransford noted that Group 1, the group that was aware they would be tested, was left on their own to come up with the best memory strategies. Presumably they tried hard, knowing they were in a psychology experiment. Suppose somebody told the students in Group #1 that the best way to learn the words was to fantasize about survival on the deserted island. Could they have used this technique? Of course! Anybody could do it. But nobody gave them this hint. Whatever strategies they adopted on their own did not work very well. This suggests that students can benefit from improved metacognition. Metacognition is thinking about thinking. One form of metacognition is knowing how your memory system works. Most students think "trying to memorize" is the key. Bransford and Wilson's experiment shows that was not the case. What are the best aids to memory? Conscious effort to memorize is not as important as organizing information and tying it together into a unified package. The best aids to memory are techniques such as integrated imagery and story telling. They organize, clarify, and knit together information. Dempster, F. M. (1988). The spacing effect: A case study in the failure to apply the results of psychological research. American Psychologist, 43, 627-634. Jenkins, J. G. & Dallenbach, K. M. (1924). Obliviscence during sleep and waking. American Journal of Psychology, 35, 605-612. Wilson, M.A. & McNaughton, B.L. (1994) Reactivation of hippocampal ensemble memories during sleep. Science, 265, 676-679.